Armagh Pipers Club 1966 - 2016. Armagh Pipers Club has been at the forefront of traditional music education since its foundation in 1966. Celebrating its 50th anniversary in 2016, Armagh Pipers Club has had an exciting programme of events through the year. Armagh Pipers Club has been teaching traditional music since 1966. Starting with a tin whistle tutor, from 1972 a series of printed tutors have evolved, the first of their kind in Irish music. Substantial tutors followed covering songs, music history, the fiddle, uilleann pipes and popular session tunes. Armagh Pipers Club is unique in the sense that it doesn’t prepare learners for competitions, rather giving them the confidence and skills to empower them to do so themselves. Individual desires are catered for through LCM grading system which acknowledges talent and competency, without the unavoidable stresses of competition. Clearly this model works, with the club beginning with four pupils, but now catering for in excess of 250 on a weekly basis and across a wide range of instruments. Brian Vallely grew up listening to Radio Eireann, and as such became familiar with Irish ballads. As a child he had the opportunity to study piano, at which his brother Dara persevered. Dara found himself playing tunes from a book called the Irish Fiddler to keep up his interest in the instrument, of which Brian remembers a variety of traditional tunes being thrashed out. Brian was introduced to Seán Ó Riada and Ceoltóirí Cualann one evening at an Irish Drama Festival in the Parochial Hall in Armagh. This turned out to be a life changing experience. While living in Edinburgh as an art student, Brian bought a German 8 keyed simple system flute on which he proceeded to learn to play traditional Irish music. Brian and Dara soon found themselves cycling all over Ireland to discover music, including meeting Willie Clancy in Miltown Malbay. On returning from Scotland and following a year in Spain and North Africa, Brian became involved with Comhaltas Ceoltóirí Éireann and soon became involved at committee level locally. He strived to bring great players like Seamus Ennis to play at Armagh. 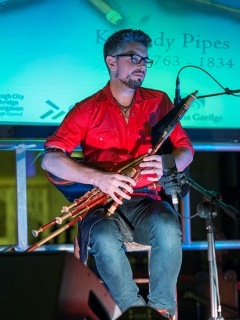 Brian soon found himself at loggerheads with the non-music playing Comhaltas committee members, over his obsession with the uilleann pipes. Brian and his brothers Dara and Niall, cousin Fintan, Peter Mackey, Jim Smyth, Matt Hughes and Micheál Hanratty formed Armagh Pipers Club in 1966. Traditional music has always been a part of Eithne’s life, with her father playing the fiddle, as did many of her uncles on both sides. As a child she would spend summers in Kilcar, in southwest Donegal, where musicians would gather for “big nights” when visitors came home from America. Eithne was initially taught the whistle by Paul Brady’s father Sean at primary school in Murlog, near Lifford in Co. Donegal then at Coláiste Bríde, Falcarragh she began playing the fiddle. When studying at UCD, Eithne found herself attending Comhaltas sessions and sessions at Thomas Street Pipers Club. After an annual visit to Miltown Malbay and a meeting with Willie Clancy, Eithne persuaded Matt Kiernan to make her a practice set of uilleann pipes on which Dan Dowd gave her a few lessons. At this time Eithne was recruited by Brendán Breathnach to transcribe tunes he had collected, for publication. On one annual pilgrimage to Miltown Malbay, Eithne met a young group of pipers from Armagh, amongst them was Brian Vallely. 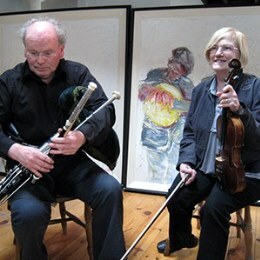 After several years teaching in Dublin, Eithne decided to move north to teach in Monaghan, at which time Brian had since moved back from Edinburgh and founded Armagh Pipers Club. Eithne offered to help with the pipers club on returning to Monaghan….and the rest is history. The 50th Anniversary Concert at Celtic Connections on January 20th got the 1966/2016 Year of club celebration off to an International start with a memorable series of performances by members past and present before a huge audience packed into the Old Fruitmarket concert venue in Glasgow. Armagh Pipers Club led groups such as Lunasa, Flook and Buille were joined by a galaxy of virtuosi performers such as Jarlath Henderson and Tiarnan O Duinnchinn on uilleann pipes, Jarlath also sang, Leo McCann accordion, Barry Kerr guitar, flute and vocals, Niall Murphy fiddle who were joined by three current club members Méabh Smyth and Mairead Mitchell on fiddles and Eoin Murphy accordion. With the three groups performing as the concert catalysts joined from time to time by the various soloists a wonderful constantly changing and innovative performance unfolded as the night went on. The stage was dominated by a huge screen charting the development of the club over the past 50 years in images of young musicians beginning their music careers as 7 or 8 year olds right through to seeing some of them performing decades later that night on the stage. The Friends of Armagh Pipers club was launched on 9th March 2016 at Armagh City Hotel. The initiative is set in the context of the 50th anniversary and engaging the thousands of past pupils who graduated through the club classes or learnt their music from many of the club publications down the years. 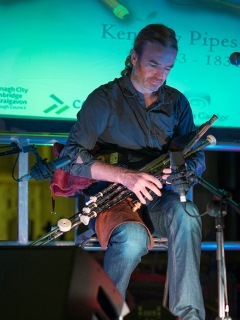 For more information please visit: www.armaghpipers.com. The 50th Annual Concert was held at the start of the St Patrick’s Festival week and featured every pupil in the club. Armagh Pipers Club was part of the St Patrick’s Festival Session Trail with an afternoon session in Áras na bPíobairí. The main St Patrick’s Day Concert featured former pupil Brian Finnegan and friends at the Marketplace Theatre on Friday 18th March. Among the invited friends who will be supporting will be Armagh Pipers Club group ‘Strings attached’. 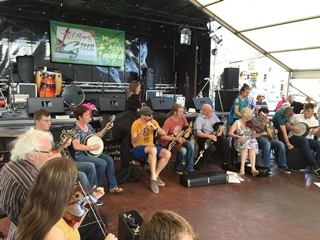 Na Páistí were winners of the junior busking prize at the annual Armagh Busking competition, held as part of the council’s St Patrick’s Festival. 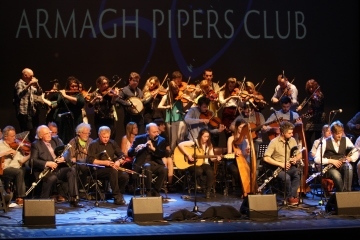 On 14th May 2016 in the Marketplace Theatre, 60 musicians representing 5 decades of Armagh Pipers Club presented an audio visual experience featuring many of the acclaimed instrumentalists, singers and composers who have emerged over the decades since 1966. William Kennedy Piping Festival - Armagh, Northern Ireland, 17-20 November 2016. Photo Credits: (1) Armagh Pipers Club logo, (2) Brian & Eithne Vallely, (3) Fiddler's Green Festival 2016, (4) 50th Anniversary Gala Concert, (5) Cillian Vallely, William Kenendy Piping Festival 2015, (6) Jarlath Henderson, William Kenendy Piping Festival 2015 (by Armagh Pipers Club/William Kennedy Piping Festival).